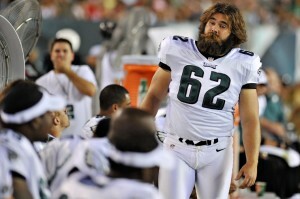 C Jason Kelce’s recovery appears to be going smoothly. C Jason Kelce appears to be fully recovered from a devastating knee injury he suffered in September of 2012, according to a report from Comcast SportsNet. If he is indeed all the way back, Kelce’s return would provide an enormous boost to an offensive line that desperately needs to rebound from a nightmarish, injury-plagued 2012. In the same report, Geoff Mosher questions Kelce’s ability to thrive outside of Howard Mudd’s system. He states that Chip Kelly’s scheme is not “a system that isn’t catered to his quickness,” but that could not be further from the truth. In fact, Kelly coveted athletic centers at Oregon and when he had them, he often pulled them on outside running plays. That system showcased Max Unger’s skills and allowed him to be a top 50 selection in the 2009 draft. Athletic centers like Kelce allowed Kelly to open up his playbook at Oregon, and it’s reasonable to expect the Eagles to carry over some of those same elements. In an offense where plays are designed to get the ball in space, athleticism is supremely important for offensive linemen, who don’t often operate in closed quarters. That’s why the Eagles spent a top-5 pick on Lane Johnson, and that’s why they’re counting on Kelce, Jason Peters, and Evan Mathis to return to form in 2013. If all five starters make it out of training camp healthy, Eagles fans have a lot to get excited about up front.